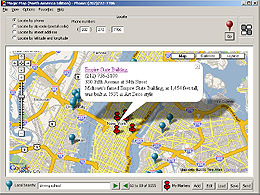 Magic Map - TekMagic Solutions Inc.
Magic Map helps you locate your targets quickly by phone numbers, street addresses, or zip numbers. You can try to find anything you are interested around any neighborhood using the new local search feature. Flexible personal marker sets can help you create customized views with your own information on the map and share them with your friends. All the information will be displayed on an interactive map with an optional satellite image overlay. 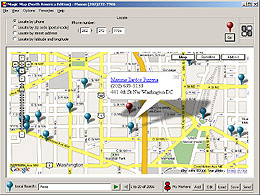 Magic Map provides its unique search engine to help you find what you are looking for. Here are some typical scenarios that Magic Map will make your life much easier. Forget John's home address before his big party? Don't worry, just type in his phone number and Magic Map will tell you where he lives and how to drive there. Want to phone your neighbor to lock your door because you forget to do that before you leave? No problem, just type in the street number across the street and Magic Map will tell you the phone number. Found a "help wanted" ad on a newspaper with only a fax number. Want to know where is the location and what they do? Easy. Just type in the fax number and Magic Map will tell you who they are and where they are. 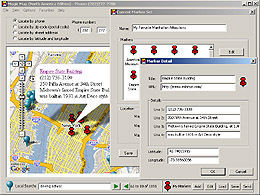 A freeware version of Magic Map with no expire date limitation for United States and Canada only. You can download this version of Magic Map free here. This version is only supported as an "AS-IS" warranty. For detail, please refer to the license agreement in product installation package. 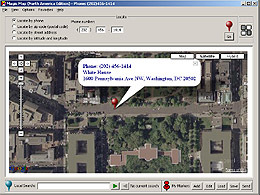 Commercial version of Magic Map with addition features for corporation users. This version will give you information around the world with great details about the hotels, flights and vacation packages.